At Morris, Simmons & Associates, we value our patient relationships, making it our priority to deliver gentle compassionate care that you deserve from a dentist in the Livonia/Westland area. We work hard to make you feel at ease by providing exceptional patient care in a relaxed, convenient atmosphere. We strive to develop lifelong relationships with our patients by combining the latest dental technology with a professional and compassionate staff. The result is a beautiful, healthy smile that lasts a lifetime. We also believe that patients should have sufficient information to make educated decisions about their oral health, treatment options and choice of dentist in the Livonia/Westland area. You'll find all of this important information on our website, including directions to our office, service descriptions, patient forms, patient education resources and more. 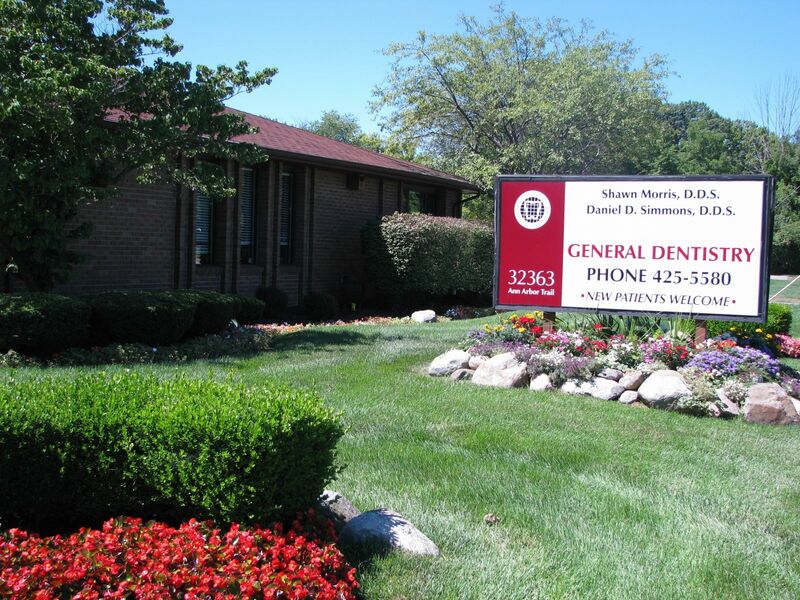 Dr. Simmons has been practicing dentistry since 2001 after graduating from University of Detroit Mercy Dental School. Dr. Simmons completed his undergrad at Eastern Michigan University with B.S. in Biochemistry and Toxicology. Dr. Morris has been practicing dentistry since 2001. He graduated from University of Detroit Mercy Dental School. Dr. Morris completed his undergrad at Eastern Michigan University with B.S. in Biology and Biochemistry, and completed a two year general practice residency at the VA Hospital Ann Arbor Healthcare System. "I just walked out of a cavity filling. In fact, my mouth is still numb. I trust this practice with my whole family. The dentists are very professional and great at what they do. Every cleaning is so thorough and personal. It feels like your visiting a friend! Few places have ever made me feel so comfortable. Great place for the whole family." "Mary, the hygienist who cleans my teeth, always does a wonderful job of not only cleaning my teeth but making me feel comfortable while she is doing it. She's always gentle and gives me helpful tips on what I should be doing to keep my teeth and gums healthy. She's the best. The staff is always friendly and pleasant, too." "My family have been going to Dr Morris and Dr Simmons since they opened their practice in Westland. I can't say enough great things about them! The entire staff is amazing!! The level of care and professionalism is top notch. Do yourself a favor and call to schedule an appointment today"
"I've been a patient at this practice for near 40 years. IMHO, there is none better. See for yourself. Make an appointment today." "My check up from Dr. Simmons went great Amy did a thorough job of cleaning my teeth They are the best!!" "Let me start by saying that I am afraid of the dentist due to dental issues in my childhood. The visit started with the incredibly friendly front office, the staff is kind and there are cookies, fruits and hot drinks available. My dental hygienist, Mary, assessed my sensitive teeth rapidly and used a numbing agent that relieved my fears of getting my teeth cleaned. Dr. Morris was great! He shared his enjoyment of Netflix in a way that put me at ease. I would highly recommend this office without reservation." "I have been going to this office my whole life! The staff is always great and super friendly!!" "The entire office came to my rescue with a dental emergency getting me in quickly to see Dr. Morris and solving my problem in a single day. We have used this office for many years, even before Drs. Morris and Simmons took over, and have always been extremely satisfied. Many of the office and dental staff have been there for a long time and take care of patients professionally with caring, dedication and understanding. We strongly recommend this dental office for children through seniors." "Dr. Simmons is always very kind and understanding. He always greets me with a smile and a hand shake. I find Dr. Simmons to be very throw and explains what the cleaning and X-Ray's may have found. I am very relaxed when I visit the Office, the staff is the best. Thank you the great service." "Dr. Morris and his staff are very professional and helpful. It has been a pleasure to be associated with your office for all these years. Thank You!" "The staff is professional and friendly. I would recommend Dr. Morris and Dr. Simmons to everyone, younger and older. Going to the dentist is never a worrisome appointment." "Love getting my teeth Cleaned! Staff is great!" "As always, excellent service. From start to finish, front office to hygienist service is professional, care is always great!" "The staff is always so friendly and professional, they "get the job done" with smiles!!" "As usual, my experience with Dr. Morris and his staff was excellent, painless, and as pleasant as a trip to the dentist could be!" "Dr. Simmons and Andrea are thorough and gentle and comforting to be around." "I arrived late but was greeted with enthusiasm and the experience was top notch." "The greatest staff and greatest dentists that you'll find anywhere. So caring and kind and do awesome dental work"
"Always a pleasant experience & I love the decor in the office." "The entire staff is amazing here. They make going to the dentist a not so bad experience!" "Dr.Simmons is a very professional man, gentle hand checking my teeth. Very clean office and room Teeth cleaning by Amy always nice." "Always a pleasure having this great office for my dental needs. Great at keeping me informed. Gleanings are smooth and efficient. Thank you!" "Dr. Simmons and the dental hygienist are excellent and the staff makes every effort to accommodate your schedule. The building and grounds are bright and cheerful as well, and I am impressed with their efforts to ease discomfort at going to the dentist with cookies and drinks"
"I always have a great experience at Drs Morris and Simmons! The staff is excellent. Very clean and everyone is so friendly."